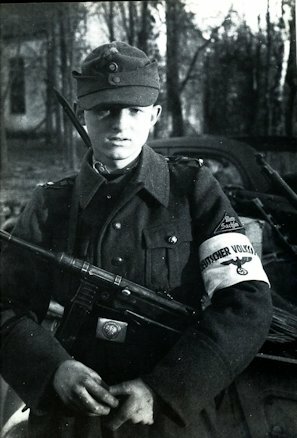 Towards the end of the war in March 1945, child soldiers were used to defend the homeland, as this 16 year old member of the Hitler Youth, who was incorporated into the Volkssturm. 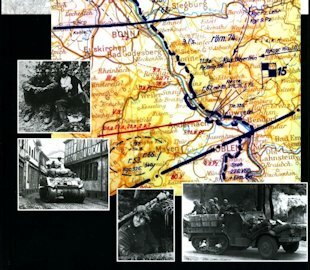 The Ardennes offensive failed. American soldiers examine the "miracle weapon", the King Tiger. This heavy tank belongs to "Kampfgruppe Peiper", the 1st SS Panzer Division. 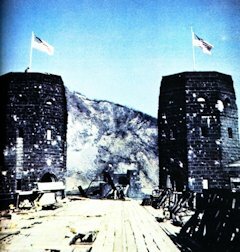 Because the Americans had surrounded them and they could not connect with the main force, all heavy weapons were left behind. The soldiers reached on foot the German lines. The Volkssturm exercises with Panzerfaust. Civilians digging a tank ditch in the Eifel. Armored convoy drives past wrecked German army vehicles. M3 Halftrack armored transport vehicle for armored infantry battalion. 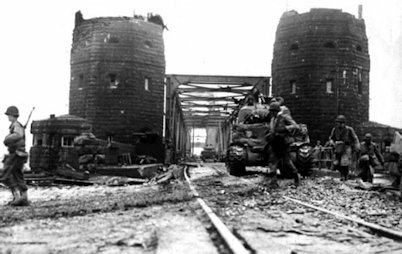 An M 3 drags a 5.7 ​​cm flak armor on the Ludendorff Bridge at Remagen. American columns stand in a queue for the Ludendorff bridge to get over driving. Guns of the type Vierlings MG 12.7 mm on a halftrack secure the crossing of troops on the Ludendorff bridge. American infantry in the devastated Mayen. American tank on the outskirts of Andernach. American tanks and infantry have passed, the tower of Koblenz and are advancing in the main street. Resistance in the western part of the main street. The front tank of Americans put on fire by a Panzerfaust. An injured crew member will be brought into safety. American infantrymen examine the small arms from captured Germans in front of 'Franziskaner Gasthaus' on the main street in Andernach. 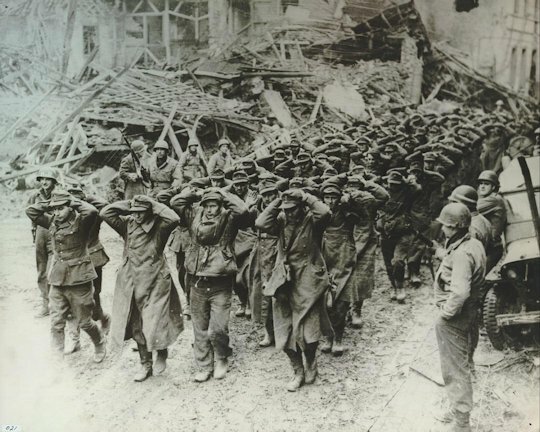 Captured German soldiers are discharged from the port of Andernach. American Sherman tanks roll through a small town to the front. A column of German prisoners marching to the hinterland to the rally for prisoners. American infantry occupied a village in the Eifel. Infantrymen of the 23th Infantry Regiment climb on the M10 tank destroyer to drive to the front. 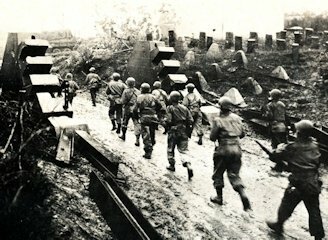 American infantry marching eastward toward the river Rhine. A German counter-attack is repulsed. 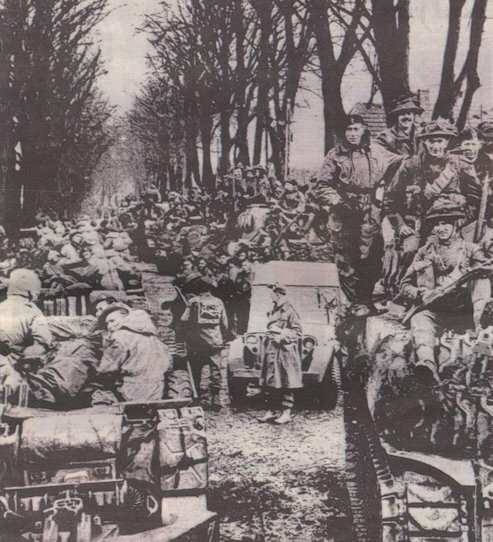 Infantry supported by tanks advancing towards the next village on the Rhine. An American infantryman is cautious and wary in a small town in the Eifel.. Advancing American infantry and lying on the ground fallen German soldiers. Infantry of the U.S. 2nd Infantry Division prepare on the attack supported by tanks. Infantry of the 2nd U.S. Infantry Division occupied Engers am Rhein. The U.S. M10 tank destroyer drives through a German tank barrier in the village street. A member of the reconnaissance unit of the American artillery has the target in sight. 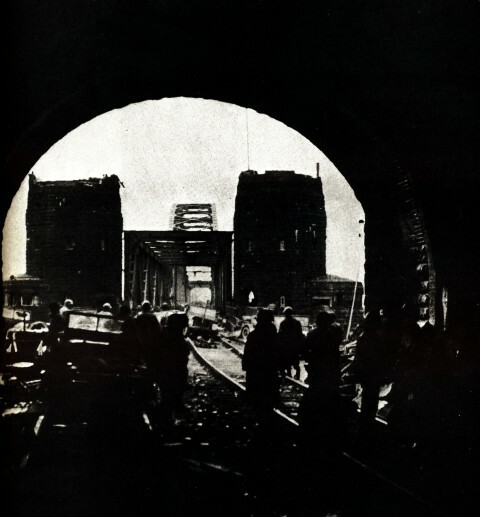 On 22 March 1945 the Victor bridge was put into use. American infantry crossing the Rhine by a LCVP. The city hall of Hönningen na de inname after taking the city on 17 March 1945. 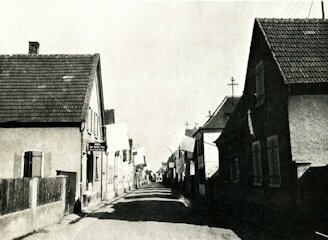 The main street of Hönningen after the capture by the American army. Whatch the white surrender flags. U.S. fighter bombers have shot this German army vehicles along the march route of the U.S. Army. An American tank driving through a village in the Eifel. Chaos at the German withdrawal from the Eifel. This light field gun 18 with 10,5 cm caliber was the standard artillery guns for the Volksgrenadiers. The heaviest weapon for the Volksgrenadiers was this 15cm howitzer. An American Sherman tank drives through a captured village. An American MP with captured child soldiers in his jeep. American infantry occupied a German town. A fallen German lies on the middle of the street. German soldier with a Panzerschreck. Light field artillery in action at Hannebach. American armored drive past a destroyed German artillery convoy. After the defeat of the German opposition gathers the infantry of the 11th Armored Division. Women and men of the Volkssturm dig a trench in the Eifel. A Sherman tank was hit by a Panzerfaust and burns out. 3,7 cm Flak des Heeres with crew and munition is ready. Tanks and armored vehicles of the 11th armored division on the road to Andernach. This M10 tankdestroyer cleared the road. Between the advancing Americans this old woman is wondering in what kind of world she lives. In an ultimate attempt to stop the enemy Pantserfausten are distributed. The fights are over and the American soldiers afford a break. On the right the company commander devides the post. American tanks and infantry to break German resistance to a forest in the East Eifel. Improved Sherman tank M4 A3E8 with 7,62 cm mounted gun. 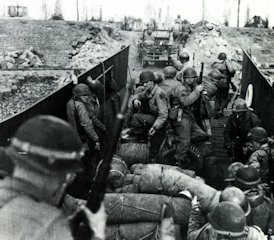 American infantry on M18 tank destroyer on the way to the Rhine. A company of Sherman tanks waiting at Remagen for the Rhine Crossing. 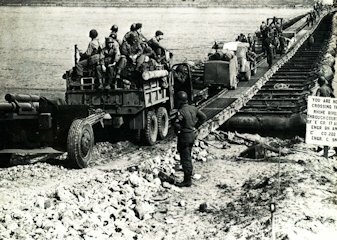 An American pontoon bridge between Shrinkage and Linz is put into service.